Analysis: These two "O"-men share style similarities, but differ in very important ways that could help determine whether O'Rourke can actually follow in Obama's footsteps. WASHINGTON — Beto O'Rourke's fans like to compare him to Barack Obama. Like the last Democratic president, the former Texas congressman — who lit the party's grassroots aflame in his losing Senate bid against Ted Cruz last November — has a natural poise on the stump, a youthful energy and an ability to transition smoothly between the articulation of lofty ideas and plain talk. And, like Obama, he says his ideas — liberal as they may be — are for Democrats, Republicans and those who don't identify with either major political party. Those parallels help explain why many Obama alumni have been drawn to O'Rourke, and it makes sense to a degree for fans of both men to invite a comparison that renews Obama's brand as the definition of a fresh, hip political figure and anoints O'Rourke as the second coming of the last Democrat to win the White House. "The strongest similarity between he and Obama, I think, is that they both believe in using the office of the presidency to give people hope, to inspire us, and to unite us toward a better tomorrow," Rep. Stephanie Murphy, D-Fla., who endorsed O'Rourke on Thursday, said in a text message. "Our country would benefit from his compassion, authenticity and unifying vision." But these two "O"-men are different in important ways that could help determine whether O'Rourke can actually follow in Obama's footsteps. When O'Rourke launched his presidential campaign Thursday in a straight-to-camera video from a couch — as Hillary Clinton did in 2007 — he described the challenges facing the country and the world in the most epic of terms. "We are truly now, more than ever, the last great hope on Earth," he said. There were nods to areas of policy, like climate change, immigration and criminal justice reform, but not much about his biography, his record or any specific plans he would embrace in his campaign. "As attractive as he is, I don’t know where Beto stands on anything," Bill Press, a liberal talk show host and author of "Buyer's Remorse: How Obama Let Progressives Down," said in a telephone interview. Some Democratic voters were disappointed that Obama wasn't able to deliver on all of his lofty campaign-trail promises, Press said. At times, O'Rourke sounds a lot like Obama. But the bar for Democratic voters buying his rhetoric may be higher. "I think a lot of people will be more demanding of Beto after the Obama experience," Press said. The truth is that O'Rourke didn't do much on the legislative front during his three terms in the minority in the House, and he didn't make a name for himself as a political force for fellow Democrats. On Thursday, while talking with Iowans, O'Rourke spoke of the different kind of experience he's had as a city council member in El Paso, Texas, and as a small-business owner. "I may not have served forever in the House — six years, three terms — but I served in other ways," he said. 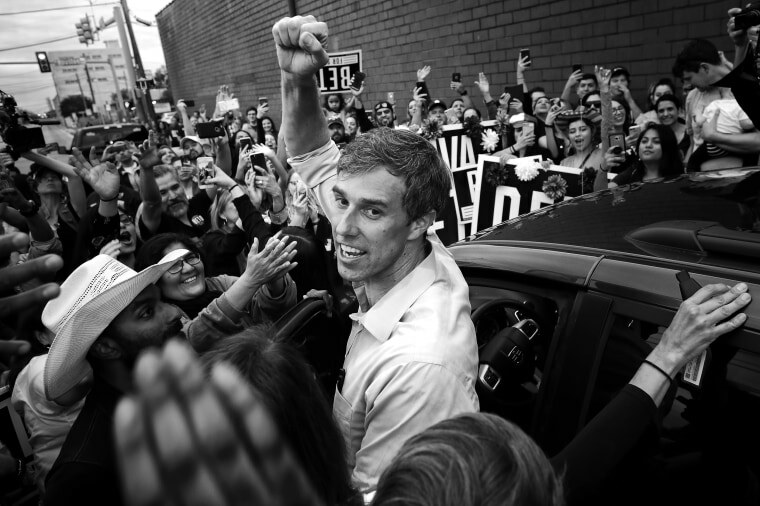 "And the way in which we campaigned... for the last two years in Texas — going everywhere, being for everyone, listening to all — that’s really what I think this country needs right now." But he comes into the 2020 scramble much less prepared than Obama was when he started his campaign for president a dozen years ago. By the time Obama arrived at the Illinois state capitol in Springfield for his official launch event, he was able to point to a legislative record both at the state and federal levels — though thinner than those of some of his rivals — with accomplishments that fit the narrative of his presidential campaign. That day, he highlighted a death penalty moratorium, health insurance for kids and ethics reform as issues he'd worked on. Fundamentally, they were nonpartisan matters that had taken bipartisan efforts to enact. More important for Democratic primary voters, Obama had spent the previous years putting together a political and policy operation that helped him legislate, navigate the land mines of Senate votes, build goodwill by traveling the country to raise money for fellow Democrats and nurture a growing national following with an ever-expanding list of donors and activists. Ben LaBolt, a Democratic strategist who worked for Obama at the White House and on the campaign trail, said there are similarities in style but differences in substance. "Neither Obama nor Beto are soundbite candidates," LaBolt said in an email exchange with NBC News. "They lay out their message in terms of a historic narrative, about what type of moment we’re experiencing. They also both work to be culturally relevant, which helps them connect with the younger generation and those voters who aren’t traditionally drawn to politics." But, he added, "Obama was defined by taking a big stand on one of the key issues of the election that differentiated him from his competitors — opposition to the war in Iraq. ... Beto is less distinguished by a big issue or record in Congress." Obama spent the three years between his landmark 2004 Democratic National Convention speech and the launch of his presidential bid preparing to run for the highest office in the land. He came ready for the fight. By contrast, O'Rourke so far has been winging it. That doesn't mean he won't use the money that is sure to roll in as fast as the semi-conductors on the campaign computers can churn to build a campaign worthy of the prize he's pursuing, but his approach has hardly been the same. The fundamentals of O’Rourke’s race are much different, too: Rather than facing just Hillary Clinton and John Edwards as serious competitors in the Democratic primary, as Obama did in 2008, O’Rourke is one of a sea of candidates, and, if he wins that scramble, he’ll go up against an incumbent president. There are also differences between the two men on policy. Bernie Sanders' supporters have taken issue with the instances in which O'Rourke voted to the political right of most Democrats to, among other things, tweak Obamacare and the Dodd-Frank financial reform law. O'Rourke also voted to condemn the Obama administration for transferring Guantánamo Bay detainees without notifying Congress. Aside from policy, there's peril in O'Rourke tying himself too closely to Obama stylistically, said one Democratic strategist: It's hard to measure up to party icons. "Do you want to be compared to JFK?" asked the strategist, who asked to remain anonymous because he may end up doing work for one of the Democratic campaigns. Jonathan Allen is a Washington-based national political reporter for NBC News who focuses on the presidency.